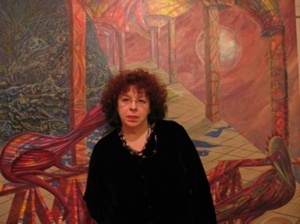 Her work has evolved from the abstract and optical energy fields influences of the 1960s through later study of the Old Master’s technique with Ernst Fuchs, to her current unique visionary alphabet that has lately included computer, digital paintings. Nurtured by Psychedelic Art, European Fantastic Realism, Surrealism and Science Fiction, her art points to an inner process, a chemical visual interaction were the inner self’s, messages are deciphered through images and symbols taking the viewer into an edgy realm of realism and unnamable forms. Her work has shown in galleries and private collections in Europe and America and has been cited in many books and publications. She is also an independent curator and has curated numerous international exhibitions. Paintings are poetic apparitions where the world is the kindling consuming fire for the soul. I paint images as if they exist in front of my eyes, dreaming up forms and entire environments, a mysterious dreamland where shapes have no name and space has no reason, liberated from everyday imprinting, floating in a realm of pure imagination. Petrification and decomposition of matter is part of the pictorial search, a penetration on the cellular level extracting a meaning that infuses all things. Academie Royal Des Beaux Arts, Belgium. Saint Martins School of the Arts, London. School of Fantastic Realism, Old Masters’ Technique Seminar, Austria. 2001 “L’ infini de Vos Reves,” Galerie D’ Art du Fantastique de L’imaginaire. 1997 “Art for Art’s Sake,” Awas Cultural Center, Belgium. 1995 “Island Sea & People Scapes,” Cocoloba Gallery, Anguilla. 1994 “Jardin et Paysages Inattendus,” Petit COQ, Galerie, Brussels. 1987 “From Crystal Cities to Chasing Rainbows”, Hawthorn Gallery, Woodstock, NY. 1985 “Crystal Cities,” Marymount Manhattan College Gallery, New York. 1981 “Archispaces”, the 84 Mercer Street Loft, New York. 1980 Romi Goldmunz Centrum, Antwerp, Belgium. 1975 P&M Larisey Gallery, Soho, New York. Canadian Society for Art of Imagination, Eco-musee du Fier Monde. Montreal. 11th. Women International Show and Women Yearbook 2015, Latino Art Museum, Pomona. CA. “ Fantastic Generations, Uncommon Visions”, Internationales Phantasten Museum Wien. “ Ancient Civilisations/Alien Technologies” Temple of Visions Gallery, Los Angeles. “ Fifty Years Fantastic” La Galleria Pall Mall, London. “ Energy Art Salon”, Murphy Hill Gallery. Chicago. “Art of Vision”, Seed Gallery, Newark NJ. (Olga Spiegel Co Curator) Society for Art of Imagination. “Miniatures & Other Small Masterpieces”, Gallery Fantasmus, Denmark. Fantasmus, Society for Art of Imagination, Denmark. The Mall Gallery, Society for Art of Imagination, London. A Toast to Toast, Synagogue for the Arts, New York. Where Science Meet Art, Society for Art of Imagination at Pennsylvania College of Technology. Flights of Imagination. HR Giger Museum, Switzerland. Festival of Fantasy and Imagination in England. The Society for Art of Imagination at Lauderdale House, London. The Inner Eye, Interart Gallery NY. April 12- to May 7. 29th Juried Show, Jurors Show, Jurors: Audrey Flack, Robert Mattison, Joseph Elliott. From Here to Eternity, Photo District Gallery, NY. Myth Magic & Metaphor, Union Street Gallery, Chicago. an online show organised by Susanne Iles. “My Life.. My City St Petersburg-(Russia), New York, at St Mark’s Church in the Bowery. “Celebrating Our Diversity”, Multicultural Exhibition at the African American Museum, Hempstead, NY. “Society for Art of Imagination”, The Gallery in Cork Street, London. “Visionary Art Exhibition,” The Orange Regional Art Gallery, a Public Art’s Museum, Orange, NSW, Australia. 2000 “The Art of Imagination”, Mall Galleries, London. 1999 “Spirit Ecco” St. Mark’s Church, Visual Arts Program, New York. 1998 “We the People” 2nd Annual Multi-cultural Art Exhibit, The African American Museum, Hempstead, NY. 1997 “Inner Dimensions/ Outer Limits” (Curated by Olga Spiegel) St. Mark’s Chuch, NY. 1996 “Belgian State of Mind”, Southern Highlands Regional Gallery, Moss Vale, Australia. “Visions of Unreality / Surreal and Fantastic Competition, Limner Gallery, NY. “56th National Mid-Year Exhibition,” Curator: Terry Dintenfass, Butler Institute of American Art, Youngstown, Ohio. “Into the Future,” Invitational, Olympia & York, New York. “Doors of Perception,” Invitational, Susan Cooper Gallery, Woodstock, NY. “Redefining Visionary Art,” Doma Gallery, NY. “7th Annual Juried Exhibition”, Curator Kim Levin, Pleiades Gallery, NY. “Prayers for Peace,” Invitational, White Light Gallery, NY. “Crystals,” Sponsor Shirley MacLaine, Beverley Hills, California. “Revelations”, 2nd Juried Exhibition, Pleiades Gallery, NY. “68th Annual Juried Exhibition”, Hudson River Museum, NY. “Holiday Show,” Air Gallery, NY. “Planetery Congress/ Center for Peace”, Curator: Jeff Bergen(ACA Galleries, NY), Toronto. “Alien,” Invitational, Sponsor: Omni Magazine, at the Planetarium, NY. 1982 “New York Visionaries”, Invitational, Graham Gallery, NY. “Space Artistry,” Invitational, Sponsor: Omni Magazine, Marshall Fields Gallery, Chicago. “World within Worlds,” invitational, Illuminarium Gallery, San Francisco, California. 1976 “Surreal Fantasy,” Hansen Gallery, New York. “Women’s Museum Group” Cork Gallery, Lincoln Center, NY. “Cornell University/ Alumini Tour”, Artist’s Open Studio, New York. “Dworken Gallery” Visionary Art, NY. “Der Akt in der Fantastichen Kunst” Austria.